Threats against a murder victim's family and voluntary prescription charges make the headlines in Northern Ireland's newspapers on Friday. First, though, the murder of a County Antrim man who was found shot dead at his home was not sanctioned by the Ulster Volunteer Force (UVF), reports the News Letter. David Hugh Murphy, 52, was shot twice in the head between Sunday evening and Tuesday morning. 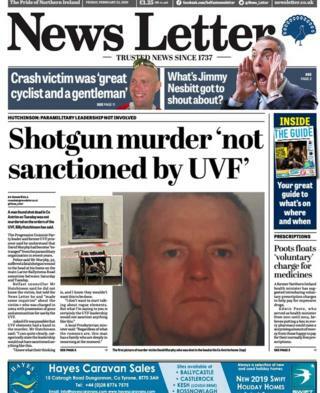 The News Letter reports that in 2004 he was charged with possession of guns and ammunition for use by the UVF. Progressive Unionist politician Billy Hutchinson told the paper that Mr Murphy had become "estranged" from paramilitaries in recent years. "I can quite clearly, categorically state the leadership would not have sanctioned anything like this," he added. "I know what their thinking is, and I know they wouldn't want this to be done." In east Belfast, family and friends of murder victim Ian Ogle have been subject to further threats since he was killed last month. The story features in the Belfast Telegraph and the Daily Mirror. Mr Ogle, who was 45, was murdered close to his home in Cluan Place on 27 January. It has been claimed that threats have since been made against his son Ryan and a young woman who is friendly with the family. Councillor John Kyle said any threat would be "utterly reprehensible". "It is completely beyond the pale and I think the whole community sees it as a disgrace," he added. A man is understood to be helping police with their inquiries into the incident. A mother and father whose newborn survived for only a number of hours have told the Irish News they do not regret carrying the pregnancy to full term in spite of knowing their baby would not survive. Dylan-Joseph Stewart-McGovern was born with the fatal foetal abnormality - anencephaly - on Tuesday morning. The condition was uncovered during a 12-week scan in October. 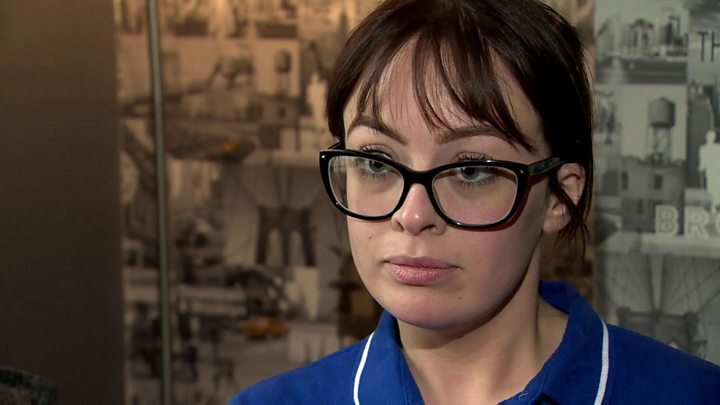 Catriona Smith, 23, told the paper that while she was told she had the option of terminating the pregnancy it was "never an option". "I wanted to hold him and meet him," she said. The Irish News reports that the Electoral Office has issued an apology after a letter warned people who identify as Irish they were jeopardising their right to vote. Sinn Féin's Michelle O'Neill said it had been a "clear breach of the Good Friday Agreement". At least 10 of the letters were sent out last month, telling those who changed their nationality to Irish that they may not be able to vote in future elections. Chief electoral officer Virginia McVea told the paper: "We would apologise to those 10 people and have reassured them all that at no point were their voting rights impacted." "Poots floats 'voluntary' charge for medicines," reads the front page of the News Letter. The paper claims that former Stormont health minister Edwin Poots has suggested that putting a box in every pharmacy could raise funds from those willing to pay. He made the comments after the government announced a 20p increase on prescription charges in England. In 2010, prescription charges were abolished in Northern Ireland. Mr Poots says: "You wouldn't be able to reintroduce the old system again - there is no appetite for it. "My suspicion is that a donation box in every pharmacy could perhaps bring in several millions pounds per year." Flights between City of Derry Airport and London Stansted are set to continue after Scottish airline Loganair announced it will replace the former operator, reports the Belfast Telegraph. It comes less than a week after Flybmi went into administration and cancelled all of its flights. Derry Mayor John Boyle hailed the news as positive. "Securing a replacement operator for this important route within such a short period of time is testament to the commitment of the council, the airport and the Department of Transport to ensure there is air connectivity between Derry and London," he added. 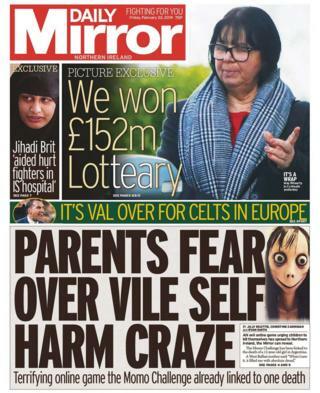 A mother has told the Daily Mirror how her child was targeted by an online game which encourages children to take part in dangerous dares, and even take their own lives. It has been linked to the death of a 12-year-old girl in Argentina. The west Belfast mum told the paper that the game - called the Momo challenge - first appeared to her child in an advert for a cowboy game. "The picture that it was showing was like country and western theme and had two cowboys with just the name Momo underneath, which I think is to entice kids in," the mum said. "It's absolute madness that something like this has even been created." The NSPCC tells the paper that parents should speak regularly to children about their online use.